The Visitor Center was a long-time dream for the US Fish and Wildlife Service and many refuge and wildlife supporters on the Outer Banks and in eastern North Carolina. It represents eleven national wildlife refuges and one national fish hatchery, offering an invitation to visit them all. Through interactive exhibits, audio-visual programs, and even a virtual airplane ride, visitors may experience a field trip to each refuge with hopes to entice them to visit these special places. 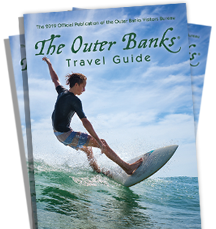 See how the Outer Banks will change as the sea level rises. Sit for a spell in the old Dare Forest Supply Store and experience life through a short multi-sensory film, when Buffalo City was a bustling logging and moonshining town! In this small theater you will also have an opportunity to watch 2 other nature and area-related films. In the main lobby, try to find 37 critters hiding in the pocosin diorama. Peek into a red wolf den. Have a picture taken of you as a genuine wild lands firefighter! A short interpreted nature trail wanders through the woods behind the center. The building is LEED (Leadership in Energy & Environmental Design) certified and energy-efficient, with features including solar panels, low-volume toilets, and a highly energy-efficient heating and cooling system. Hours of Operation: Monday-Saturday 9 am-4 pm and Sunday Noon-4 pm. National Wildlife Refuges Visitor Center is free and open to the public seven days a week, year-round.